Charlotte is available to speak on television and radio, whether live or prerecorded, as well as providing quotes for print and online media on topics related to mental health. 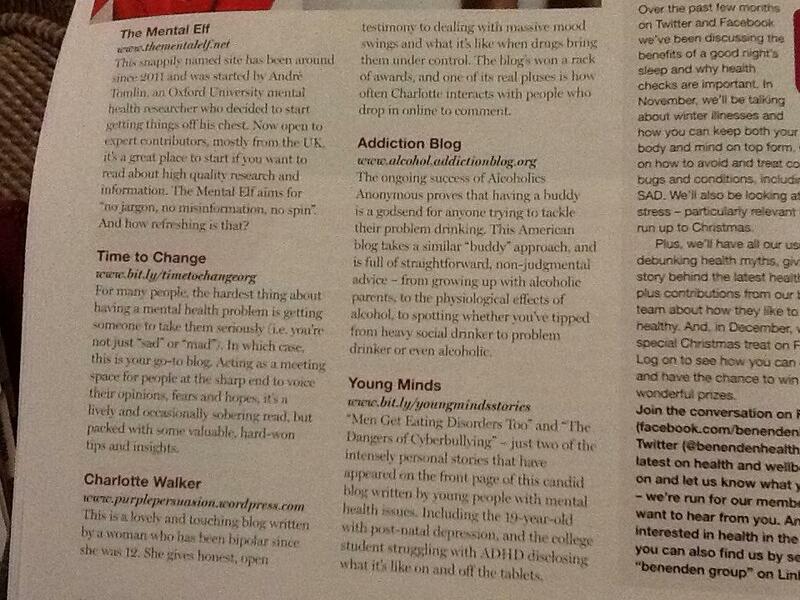 16/02/2015 Guest blogger for Mumsnet on the need to improve mental health support for teachers and pupils in schools. Autumn/Winter 2013 edition of One in Four Magazine (published May 2014): The Drugs do Work. 20/02/2014 Expert panel member at London Medfest, the medical film festival, alongside Dr Raj Persaud, Dr Kier Shiels (who appeared on Your Life in Their Hands) and Dr Kamran Ahmed, consultant psychiatrist and filmmaker. 11/02/2014 Contributor to a series of blogs in which “leading figures in the mental health world what it would take to improve things for people with serious mental illness” commissioned to mark the departure of Paul Jenkins as CEO of Rethink Mental Illness. 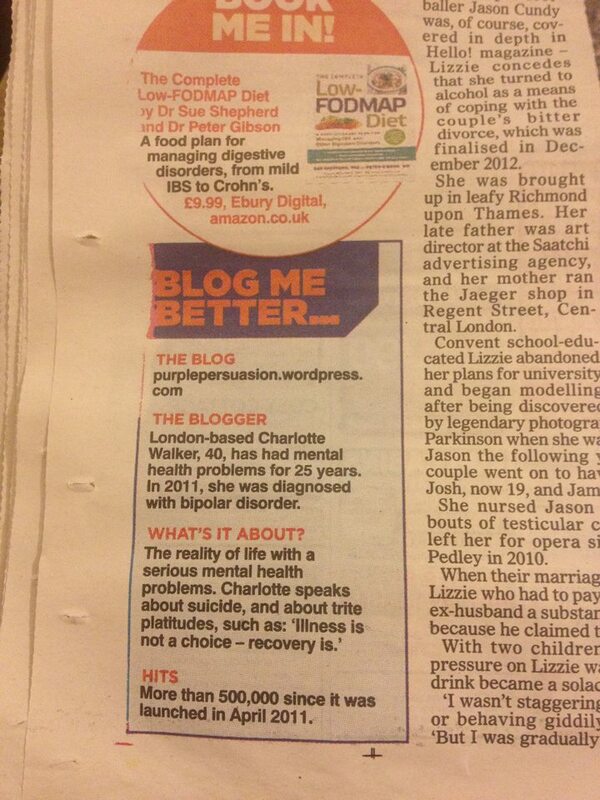 04/05/2013 Bipolar Holiday piece published by BBC Ouch! I read your post about 10 things not to say to people who want to commit suicide. I feel like dying right now. I’ve been with this man 13 years I’ve had six restraining orders on him it feels like I’m in a hole and can’t get out. We just go back-and-forth and back-and-forth and fight and when the times when I told him to move out he goes through it’s going to be 30 days I’m taking the cats. He’s actually said to me well why don’t you do it you’ve said it so many times what you just go drive off a cliff. Today just might be the day there’s a 17 year difference me being the older one but I guess I look younger but who cares about that. I’ve gone through most of those years with him being an alcoholic he supposedly quit but I think he still sneaking it. What to do I don’t know.